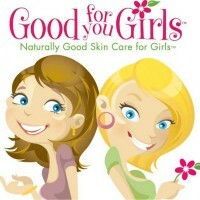 Welcome to the beautiful, natural world of Good For You Girls where girls are treated with respect and their skin is pampered and protected the way mother nature intended. This positive message is carried throughout the store, via a line of proprietary products for young women. This began as one mother's quest to create skin care products for two daughters who were asthmatic with sensitive skin care issues. The products are free of gluten, synthetic fragrances or dyes, mineral oils, phthalates, sulfates and parabens. They are also made in the U.S.A. and cruelty free. Your dashing National Product Reviewer and our niece went online and ordered three items. The three-ounce deodorant, strawberry and peppermint lip balm and an eight-ounce honeydew body wash. They also included 2 facial cleansing samples. All of these items smell incredible. Design is clean, simply and pretty. Each was wrapped in pretty tissue papers (pink and green).